Last week I was scrolling through snap chat and found this recipe for S’mores Cupcakes. I always look for recipes that are foolproof and anything S’mores related is typically pretty simple. You know – they’re not meant to be attractive so you can get away with just throwing all of the ingredients together. Before you get into this post you have to know that this was an absolute mess. I hate recipes that seem simple and turn into a disaster. This is one where you have like 6 bowls dirty and your butter explodes in the microwave (no that really happened when I only put it in for 15 seconds). It was such as a pain as I made it that I told myself I would never make this recipe again. Fast forward to trying a S’mores cupcake for the first time and I am hooked. I will most definitely be making these again. They were so good that the typical “dieters” at the party had 2 or 3 of them! However, when I do recreate this recipe I am going to make them as mini cupcakes instead of the full sized one. I also found that I had A LOT of ingredients left over which I hate. Although you can’t exactly make half a box of devils food cake. So I would suggest having extra chocolate chips, heavy cream, and marshmallows so that you can make more of the ganache and have extra marshmallows for topping. Preheat oven to 350 degrees F. Line a two 12-cup muffin tins with cupcake liners. Meanwhile, combine graham cracker crumbs, butter, and sugar in small bowl. Press about 1 tablespoon of the mixture into each cupcake liner to make mini crusts. Prepare cake mix according to box instructions. Divide batter between cupcake liners and bake for a couple minutes less than the box instructs, about 16 minutes. While the cupcakes are baking, make a quick ganache. Place chocolate chips in a medium, heatproof bowl and set aside. Heat heavy cream in a small saucepan over medium heat. When bubbles begin to break the surface around the edges of the pan, turn off the heat. Pour the hot cream over chocolate chips, whisking constantly until the sauce is smooth. My heavy cream boiled up a bunch because I stopped paying attention and the ganache still tasted great. Pro tip: I used milk chocolate chips and added a bit of sugar into mine to cut the bitterness. When your cupcakes are almost done baking, pull them out and spoon about a tablespoon of ganache onto each cupcake then top each with a marshmallow. Return the tray to the oven and bake—watching closely!—until the marshmallows are golden and very soft, 4-5 more minutes. This step was a disaster the ganache is runny and the marshmallows slide off. On the outside of the pan I just placed the marshmallows on the inside of the cupcake. That way I didn’t get melted marshmallow all over the oven. When they come out it is easy to push the marshmallow back into place on top. I love scrolling through food videos on Facebook but they’re so frustrating because you know that you could never recreate them. Enter this pie – a Facebook food video that you can actually make! Sometime last week I was scrolling through Facebook and I watched this video from Tip Hero. I usually find that these recipes look delicious but they’re nearly impossible to recreate. This one was easy and a big hit at our 4th of July Party. The top half is before it was cooked and the bottom half is after. Below is the recipe copied from the Tip Hero website. In (italics) I have added my comments on the changes I made to the recipe. Everyone loved it and they are excited to have it again next year! On Christmas morning I had the best idea. I was going to make a Santa hat pancake but I couldn’t find any red food dye. While I was digging through my boyfriends parents’ cabinet I stumbled upon a basket full of cookie cutters. So I found a metal gingerbread man and some nonstick spray and got to work. I always use a countertop nonstick griddle to make pancakes. I made the batter like a normally do. I sprayed the bottom of the cookie cutter nonstick spray and poured some batter into it. 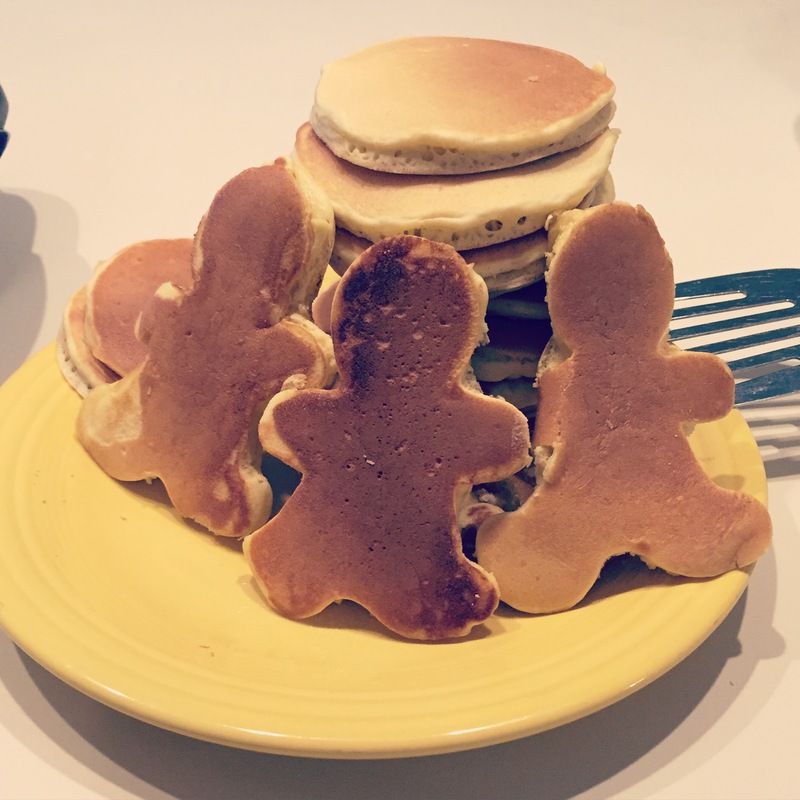 A little bit came out of the edges (I realized afterwards the cookie cutter was bent) but it was easy to see the shape of the gingerbread man and remove the excess from the finished pancake as needed. I let them sit a little bit longer than I would have left a regular pancake to cook because they were a little thick. I used a knife to lift the metal cookie cutter because it got a little hot. The process definitely isn’t perfect but it was a lot of fun and a neat addition to a holiday breakfast. Would I do this again? Definitely, it wasn’t very hard to do at all! It would be easy to make these prettier. But, I didn’t think about writing and post this when I was making them. I just wanted to quickly throw something cute together on Christmas morning. Calling all pumpkin lovers! If you have 45 minutes free you have enough time to try these. Three ingredients is all it takes to make these tasty and moist pumpkin muffins. The best thing is that they are Guilt-Free. Preheat the oven to 350 degrees and spray your mini muffin pan with baking non-stick spray. 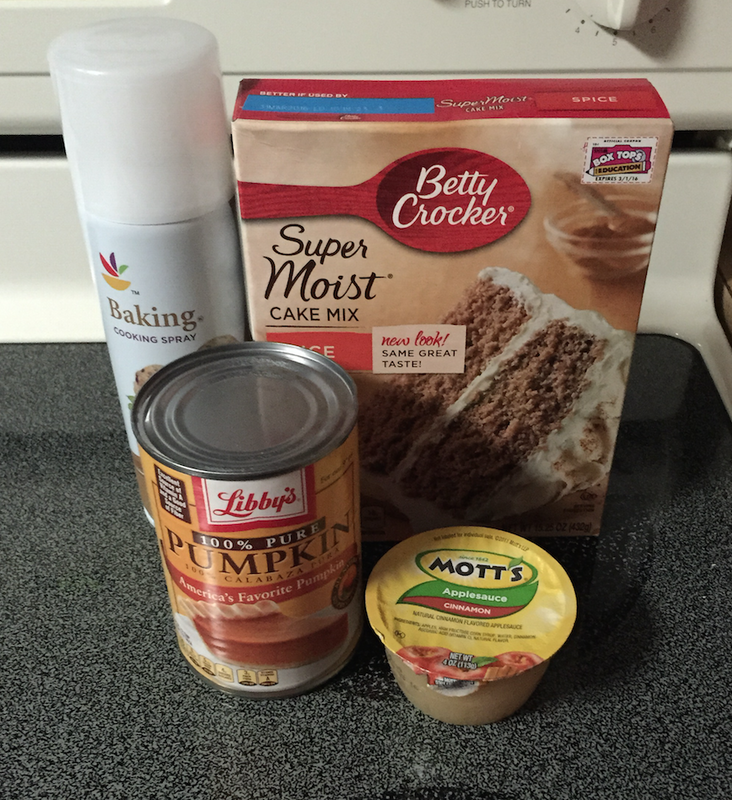 I prefer the PAM Baking Spray — it is the best thing I’ve ever used. When making cakes in a bundt pan I have always had them fall apart — since using PAM I haven’t had that problem. I used Giant brand baking spray for this and did not like it at all. Take all of your ingredients (cake mix, can of pumpkin, & apple sauce) and mix them together in one bowl until well combined. I know that you want to read the directions on the back of the cake mix box and add more ingredients…don’t! I promise this recipe is fool proof. Scoop the mixture into your mini muffin tin and fill until 2/3 full. I never use cupcake liners unless I am going to take these somewhere. They are eaten so quickly that it would be a waste. Bake for 10 minutes at 350 degrees. Store in an air-tight container once cooled completely.